First day and I already cheated… I used a mix. (Boring excuse of how I’m out of town for the holidays and it would be too expensive to buy all the ingredients for just one drink, bla, bla ,bla… can’t take it with me on the plane home, bla,bla, bla…) I made two drinks, one drink following the directions on the Mr & Mrs T Spicy Bloody Mary Mix bottle and a second following “the book” but substituting tomato juice with the cocktail mix. The results: Disappointed with both… Disappointed is a relative term here (like flipping through the Victoria’s Secret catalog and saying “nah, I don’t like her squinty eyes…”) give me a bottle of mix and vodka and I’ll knock ’em back all day but I like my Bloody Mary’s to have a lot of kick in them. The directions on the mix bottle (4oz of mix and 1 oz of vodka) was way too bland. “The book” made it a better by adding worcestershire sauce, a little more lemon juice, Tabasco sauce, and some salt and pepper… these were doable. But add some extra horseradish, a few olives (pour in some of the olive juice), cayenne pepper, celery salt… and a wee bit more vodka – now we’re talking! Pour it all over ice in a tall glass and mix it up with a big celery stick (make sure you throw the celery away so you don’t eat that $#! * by mistake!) cross your fingers and hope your heart can handle the shock as you knock that liquid devil back. Best time to drink: If you’re mixing this drink up while still in bed, sunlight just starting to crack through the blinds and you can only manage to open one eye … then you’re doin’ it right! This is a great wake-me-up drink and it’s got tomato juice so that makes it a healthy breakfast! 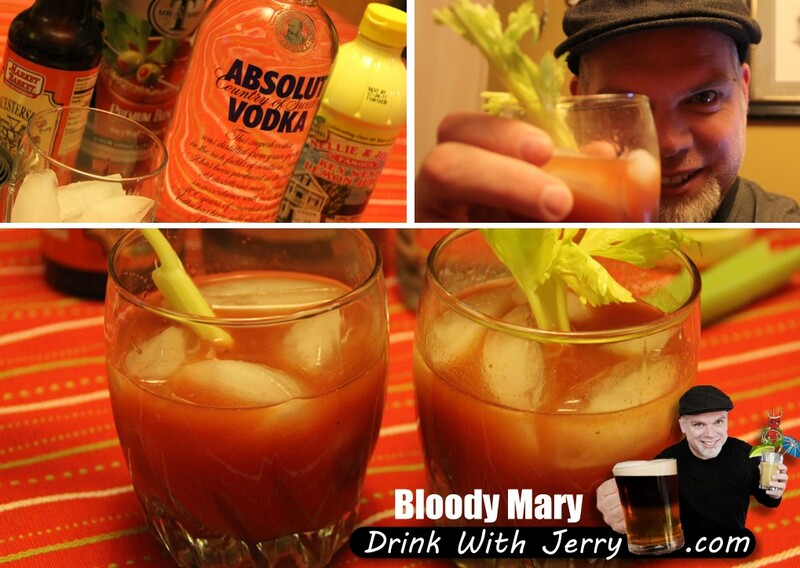 Drink Tip: The Bloody Mary is a very personal drink so it takes some practice to get it exactly the way you like it. I recommend finding a bar or restaurant with a Bloody Mary bar that has all the ingredients and lets you mix it up yourself.